Coronary artery atherosclerosis is the single largest killer of men and women in the United States. It is the principal cause of coronary artery disease (CAD), in which atherosclerotic changes are present within the walls of the coronary arteries. See the image below. In high- and intermediate-risk patients with 3-vessel disease, PCI was associated with significantly higher rates of revascularization and of major adverse cardiac and cerebrovascular events than CABG [2, 3] ; the 2 procedures were equally effective in the treatment of low-risk patients with 3-vessel disease and in low- and intermediate-risk patients with left main CAD. Coronary artery atherosclerosis is the single largest killer of men and women in the United States. It is the principal cause of coronary artery disease (CAD), in which atherosclerotic changes are present within the walls of the coronary arteries. CAD is a progressive disease process that generally begins in childhood and manifests clinically in middle to late adulthood. A major advance in the treatment of coronary artery atherosclerosis has been the development of a refined understanding of the nature of atherosclerotic plaque and the phenomenon of plaque rupture, which is the predominant cause of acute coronary syndrome (ACS) and AMI. Cardiologists now know that in many cases (perhaps more than half), the plaque that ruptures and results in the clinical syndromes of ACS and AMI is less than 50% occlusive. These so-called vulnerable plaques, as compared with stable plaques, consist of a large lipid core, inflammatory cells, and thin, fibrous caps that are subjected to greater biomechanical stress, thus leading to rupture that perpetuates thrombosis and ACS. The process of plaque rupture is illustrated in the diagram below. The intima is an inner monolayer of endothelial cells lining the lumen; it is bound on the outside by internal elastic lamina, a fenestrated sheet of elastin fibers. The thin subendothelial space in between contains thin elastin and collagen fibers along with a few smooth muscle cells (SMCs). The media are bound on the outside by an external elastic lamina that separates them from the adventitia, which consists mainly of fibroblasts, SMCs, and a matrix containing collagen and proteoglycans. The endothelium is the monolayered inner lining of the vascular system. It covers almost 700 m2 and weighs 1.5 kg. The endothelium has various functions. It provides a nonthrombogenic surface via a surface covering of heparan sulfate and through the production of prostaglandin derivatives such as prostacyclin, which is a potent vasodilator and an inhibitor of platelet aggregation. The endothelium secretes the most potent vasodilator, endothelium-derived relaxing factor (EDRF), a thiolated form of nitric oxide. EDRF formation by endothelium is critical in maintaining a balance between vasoconstriction and vasodilation in the process of arterial homeostasis. The endothelium also secretes agents that are effective in lysing fibrin clots. These agents include plasminogen and procoagulant materials, such as von Willebrand factor and type 1 plasminogen activator inhibitor. In addition, the endothelium secretes various cytokines and adhesion molecules, such as vascular cell adhesion molecule-1 and intercellular adhesion molecule-1, and numerous vasoactive agents, such as endothelin, A-II, serotonin, and platelet-derived growth factor, which may be important in vasoconstriction. Initially thought to be a chronic, slowly progressive, degenerative disease, atherosclerosis is a disorder with periods of activity and quiescence. Although a systemic disease, atherosclerosis manifests in a focal manner and affects different organ systems in different patients for reasons that remain unclear. The lesions of atherosclerosis do not occur in a random fashion. Hemodynamic factors interact with the activated vascular endothelium. Fluid shear stresses generated by blood flow influence the phenotype of the endothelial cells by modulation of gene expression and regulation of the activity of flow-sensitive proteins. Atherosclerotic plaques (or atheromas), which may require 10-15 years for full development, characteristically occur in regions of branching and marked curvature at areas of geometric irregularity and where blood undergoes sudden changes in velocity and direction of flow. Decreased shear stress and turbulence may promote atherogenesis at these important sites within the coronary arteries, the major branches of the thoracic and abdominal aorta, and the large conduit vessels of the lower extremities. A study by Samady et al suggests low shear segments in the coronary arteries develop greater plaque and necrotic core progression and constrictive remodeling, whereas high shear segments develop greater necrotic core and calcium progression, regression of fibrous and fibrofatty tissue, and excessive expansive remodeling. This suggests a transformation to a more vulnerable phenotype. The earliest pathologic lesion of atherosclerosis is the fatty streak, which is observed in the aorta and coronary arteries of most individuals by age 20 years. The fatty streak is the result of focal accumulation of serum lipoproteins within the intima of the vessel wall. Microscopy reveals lipid-laden macrophages, T lymphocytes, and smooth muscle cells in varying proportions. 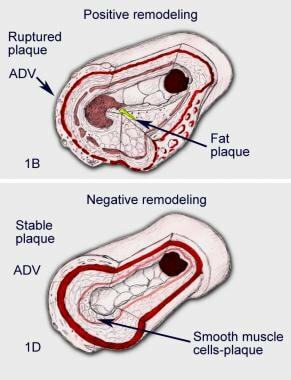 The fatty streak may progress to form a fibrous plaque, the result of progressive lipid accumulation and the migration and proliferation of SMCs. Platelet-derived growth factor, insulinlike growth factor, transforming growth factors alpha and beta, thrombin, and angiotensin II (A-II) are potent mitogens that are produced by activated platelets, macrophages, and dysfunctional endothelial cells that characterize early atherogenesis, vascular inflammation, and platelet-rich thrombosis at sites of endothelial disruption. The relative deficiency of endothelium-derived nitric oxide further potentiates this proliferative stage of plaque maturation. As endothelial injury and inflammation progress, fibroatheromas grow and form the plaque. As the plaque grows, 2 types of remodeling, positive remodeling and negative remodeling, occur, as illustrated in the image below. Positive remodeling is an outward compensatory remodeling (the Glagov phenomenon) in which the arterial wall bulges outward and the lumen remains uncompromised. Such plaques grow further; however, they usually do not cause angina, because they do not become hemodynamically significant for a long time. In fact, the plaque does not begin to encroach on the lumen until it occupies 40% of the cross-sectional area. The encroachment must be at least 50-70% to cause flow limitation. Such positively remodeled lesions thus form the bulk of the vulnerable plaques, grow for years, and are more prone to result in plaque rupture and ACS than stable angina, as documented by intravascular ultrasonography (IVUS) studies. Many fewer lesions exhibit almost no compensatory vascular dilation, and the atheroma steadily grows inward, causing gradual luminal narrowing. 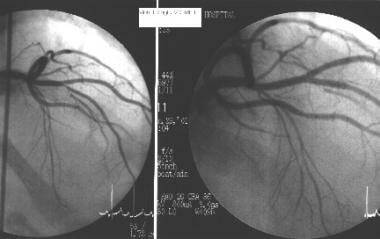 Many of the plaques with initial positive remodeling eventually progress to the negative remodeling stage, causing narrowing of the vascular lumen. Such plaques usually lead to the development of stable angina. They are also vulnerable to plaque rupture and thrombosis. Denudation of the overlying endothelium or rupture of the protective fibrous cap may result in exposure of the thrombogenic contents of the core of the plaque to the circulating blood. This exposure constitutes an advanced or complicated lesion. The plaque rupture occurs due to weakening of the fibrous cap. Inflammatory cells localize to the shoulder region of the vulnerable plaque. T lymphocytes elaborate interferon gamma, an important cytokine that impairs vascular smooth muscle cell proliferation and collagen synthesis. Furthermore, activated macrophages produce matrix metalloproteinases that degrade collagen. These mechanisms explain the predisposition to plaque rupture and highlight the role of inflammation in the genesis of the complications of the fibrous atheromatous plaque. A plaque rupture may result in thrombus formation, partial or complete occlusion of the blood vessel, and progression of the atherosclerotic lesion due to organization of the thrombus and incorporation within the plaque. Plaque rupture is the main event that causes acute presentations. However, severely obstructive coronary atheromas do not usually cause ACS and MI. In fact, most of the atheromas that cause ACS are less than 50% occlusive, as demonstrated by coronary arteriography. Atheromas with smaller obstruction experience greater wall tension, which changes in direct proportion to their radii. 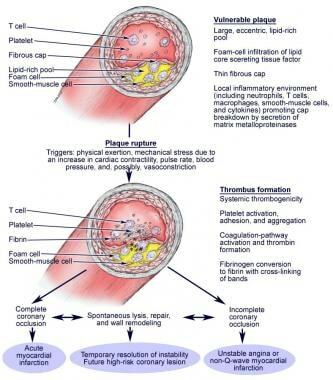 Most plaque ruptures occur because of disruption of the fibrous cap, which allows contact between the highly thrombogenic lipid core and the blood. These modestly obstructive plaques, which have a greater burden of soft lipid core and thinner fibrous caps with chemoactive cellular infiltration near the shoulder region, are called vulnerable plaques. The amount of collagen in the fibrous cap depends on the balance between synthesis and destruction of intercellular matrix and inflammatory cell activation. T cells that accumulate at sites of plaque rupture and thrombosis produce the cytokine interferon gamma, which inhibits collagen synthesis. Already-formed collagen is degraded by macrophages that produce proteolytic enzymes and by matrix metalloproteinases (MMPs), particularly MMP-1, MMP-13, MMP-3, and MMP-9. The MMPs are induced by macrophage- and SMC-derived cytokines such as IL-1, tumor necrosis factor (TNF), and CD154 or TNF-alpha. Authorities postulate that lipid lowering stabilizes the vulnerable plaques by modulating the activity of the macrophage-derived MMPs. In a type I lesion, the endothelium expresses surface adhesion molecules E selectin and P selectin, attracting more polymorphonuclear cells and monocytes in the subendothelial space. In a type II lesion, macrophages begin to take up large amounts of LDL (fatty streak). In a type III lesion, as the process continues, macrophages become foam cells. In a type IV lesion, lipid exudes into the extracellular space and begins to coalesce to form the lipid core. In a type V lesion, SMCs and fibroblasts move in, forming fibroatheromas with soft inner lipid cores and outer fibrous caps. In a type VI lesion, rupture of the fibrous cap with resultant thrombosis causes ACS. As lesions stabilize, they become fibrocalcific (type VII lesion) and, ultimately, fibrotic with extensive collagen content (type VIII lesion). The encrustation theory, proposed by Rokitansky in 1851, suggested that atherosclerosis begins in the intima with deposition of thrombus and its subsequent organization by the infiltration of fibroblasts and secondary lipid deposition. In 1856, Virchow proposed that atherosclerosis starts with lipid transudation into the arterial wall and its interaction with cellular and extracellular elements, causing "intimal proliferation." In his response-to-injury hypothesis, Ross postulated that atherosclerosis begins with endothelial injury, making the endothelium susceptible to the accumulation of lipids and the deposition of thrombus. The mechanisms of atherogenesis remain uncertain, but the response-to-injury hypothesis is the most widely accepted proposal. According to the response-to–vascular injury theory, injury to the endothelium by local disturbances of blood flow at angulated or branch points, along with systemic risk factors, perpetuates a series of events that culminate in the development of atherosclerotic plaque. Endothelial dysfunction is the initial step that allows diffusion of lipids and inflammatory cells (ie, monocytes, T lymphocytes) into the endothelial and subendothelial spaces. Secretion of cytokines and growth factors promotes intimal migration, SMC proliferation, and accumulation of collagen matrix and of monocytes and other white blood cells, forming an atheroma. More advanced atheromas, even though nonocclusive, may rupture, thus leading to thrombosis and the development of ACS and MI. The most atherogenic type of lipid is the low-density lipoprotein (LDL) component of total serum cholesterol. The endothelium's ability to modify lipoproteins may be particularly important in atherogenesis. LDLs appear to be modified by a process of low-level oxidation when bound to the LDL receptor, internalized, and transported through the endothelium. LDLs initially accrue in the subendothelial space and stimulate vascular cells to produce cytokines for recruiting monocytes, which causes further LDL oxidation. Extensively oxidized LDL (oxLDL), which is exceedingly atherogenic, is picked up by the scavenger receptors on macrophages, which absorb the LDL. Cholesterol accumulation in macrophages is promoted by oxLDL; the macrophages then become foam cells. In addition, oxLDL enhances endothelial production of leukocyte adhesion molecules (ie, cytokines and growth factors that regulate SMC proliferation, collagen degradation, and thrombosis [eg, vascular cell adhesion molecule-1, intercellular cell adhesion molecule-1]). Oxidized LDL inhibits nitric oxide synthase activity and increasing reactive oxygen species generation (eg, superoxide, hydrogen peroxide), thus reducing endothelium-dependent vasodilation. Moreover, oxLDL alters the SMC response to A-II stimulation and increasing vascular A-II concentrations. The SMCs that proliferate in the intima to form advanced atheromas are originally derived from the media. The theory that accumulation of SMCs in the intima represents the sine qua non of the lesions of advanced atherosclerosis is now widely accepted. Substantial evidence suggests that oxLDL is the prominent component of atheromas. Antibodies against oxLDL react with atherosclerotic plaques, and plasma levels of immunoreactive altered LDL are greater in persons with AMI than in controls. Oxidative stress has therefore been recognized as the most significant contributor to atherosclerosis by causing LDL oxidation and increasing nitric oxide breakdown. Numerous novel risk factors have been identified that add to the predictive value of the established risk factors and may prove to be a target for future medical interventions. The presence of risk factors accelerates the rate of development of atherosclerosis. Diabetes causes endothelial dysfunction, decreases endothelial thromboresistance, and increases platelet activity, thus accelerating atherosclerosis. Established risk factors successfully predict future cardiac events in about 50-60% of patients. A concerted effort to identify is also being made to validate new markers of future risk of the clinical consequences of atherosclerosis has been made. For more information, see Risk Factors for Coronary Artery Disease. The true frequency of atherosclerosis is difficult, if not impossible, to accurately determine because it is a predominantly asymptomatic condition. The process of atherosclerosis begins in childhood with the development of fatty streaks. These lesions can be found in the aorta shortly after birth and appear in increasing numbers in those aged 8-18 years. More advanced lesions begin to develop when individuals are aged approximately 25 years. Subsequently, an increasing prevalence of the advanced complicated lesions of atherosclerosis is noted, and the organ-specific clinical manifestations of the disease increase with age through the fifth and sixth decades of life. In the United States, approximately 14 million persons experience CAD and its various complications. Congestive heart failure (CHF) that develops because of ischemic cardiomyopathy in hypertensive MI survivors has become the most common discharge diagnosis for patients in American hospitals. Approximately 80 million people, or 36.3% of the population, have cardiovascular disease. Annually, approximately 1.5 million Americans have an AMI, a third of whom die. In 2009, 785,000 Americans were estimated to have suffered a first MI, and about 470,000 Americans were estimated to have had a recurrent event. An additional 195,000 "silent" heart attacks are estimated to occur each year. About every 34 seconds, an American will have an MI. CAD remains the number 1 cause of death for men and women in the United States and is responsible for approximately 20% of all US deaths. From 1995–2005, the death rate from CAD declined 34.3%, but the actual number of deaths declined only 19.4%. The international incidence of ACS and AMI, especially in developed countries, is similar to that observed in the United States. Despite consumption of rich foods, inhabitants of France and the Mediterranean region appear to have a lower incidence of CAD. This phenomenon (sometimes called the French paradox) is partly explained by greater use of alcohol, with its possible HDL-raising benefit, and by consumption of the Mediterranean diet, which includes predominant use of monounsaturated fatty acids, such as olive oil or canola oil, as well as omega-3 fatty acids, which are less atherogenic. Eskimos have been found to have a lower prevalence of CAD as a result of consuming fish oils containing omega-3 fatty acids. Findings from the World Health Organization's Monitor Trends in Cardiovascular Diseases (MONICA) project involving 21 countries showed a 4% fall in CAD death rates. Improvement in the case fatality rate accounted for only one third of the decline. However, two thirds of the decline resulted from a reduction in the number of events. These findings strongly suggest that the largest impact on decreasing the global burden of atherosclerosis will come from prevention of events. The frequency of clinical manifestations of atherosclerosis in Great Britain, west of Scotland in particular, is especially high. The same is true of Scandinavia in general and of Finland in particular. Russia and many of the former states of the Soviet Union have recently experienced an exponential increase in the frequency of coronary heart disease that likely is the result of widespread economic hardship and social upheaval, a high prevalence of cigarette habituation, and a diet high in saturated fats. The frequency of coronary heart disease in the Far East is significantly lower than that documented in the West. Ill-defined genetic reasons for this phenomenon may exist, but significant interest surrounds the role of diet and other environmental factors in the absence of clinical atherosclerotic vascular disease in these populations. Atherosclerotic cardiovascular disease is also rare on the African continent, although growing evidence indicates that this too is changing, as a result of rapid westernization and urbanization of the traditionally rural and agrarian African populations. The prevalence of coronary heart disease is also increasing in the Middle East, India, and Central and South America. The rate of CAD in ethnic immigrant populations in the United States approaches that of the disease in whites, supporting the role of these putative environmental factors. The incidence, prevalence, and manifestations of CAD vary significantly with race, as does the response to therapy. Asian Indians exhibit a 2- to 3-fold higher prevalence of CAD than do whites in the United States. They also have greater prevalences of hypoalphalipoproteinemia, high lipoprotein(a) levels, and diabetes. Women should be considered as high risk, and as candidates for aggressive treatment, if their risk of dying from any cardiovascular event in the next 10 years is 10% or greater. Research studies should publish efficacy and adverse drug reactions (ADRs) by gender, as both can differ in women. Effectiveness-based considerations have reduced the strength of previous recommendations for use of aspirin, statins (in women with elevated C-reactive protein but normal cholesterol), and aggressive glycemic control in diabetes. Age is the strongest risk factor for the development of CAD. Most cases of CAD become clinically apparent in patients aged 40 years or older, but elderly persons experience higher mortality and morbidity rates from it. Approximately 82% of people who die of CAD are 65 years or older. Complication rates of multiple therapeutic interventions tend to be higher in the elderly; however, the magnitude of benefit from the same interventions is greater in this population, because these patients form a high-risk subgroup. Of note, algorithms for predicting the risk of cardiovascular disease have generally been developed for a follow-up period of no more than 10 years. However, clustering of risk factors at younger ages and increasing life expectancy suggest the need for longer-term risk prediction. As previously mentioned, approximately 1.5 million Americans per year have an AMI, with a third of these events proving fatal. The survivors of MI have a poor prognosis, carrying a 1.5- to 15-fold higher risk of mortality and morbidity than the rest of the population. Historically, for example, 25% of men and 38% of women die within 1 year after having an MI, although these rates may overstate the 1-year mortality today, given advances in the treatment of CHF and sudden cardiac death. Among survivors, 18% of men and 34% of women have a second MI within 6 years, 7% of men and 6% of women die suddenly, 22% of men and 46% of women are disabled with CHF, and 8% of men and 11% of women have a stroke. According to a prospective study using data from the Coronary CT Angiography Evaluation for Clinical Outcomes: An International Multicenter (CONFIRM) Registry, incident mortality and MI rates do not differ significantly between men and women among patients matched for age, risk factors, symptoms, and extent of CAD. These findings conflict with those from the Women’s Health Initiative, which found that in women with nonspecific or atypical chest pain, the risk of nonfatal MI is twice as great as that in men. The prognosis of atherosclerosis also depends on systemic burden of disease, the vascular bed(s) involved, and the degree of flow limitation. Wide variability is noted, and clinicians appreciate that many patients with critical limitation of flow to vital organs may survive many years, despite a heavy burden of disease. Conversely, MI or sudden cardiac death may be the first clinical manifestation of atherosclerotic cardiovascular disease in a patient who is otherwise asymptomatic with minimal luminal stenosis and a light burden of disease. Much of this phenotypic variability is likely to be determined by the relative stability of the vascular plaque burden. Plaque rupture and exposure of the thrombogenic lipid core are critical events in the expression of this disease process and determine the prognosis. The ability to determine and quantify risk and prognosis in patients with atherosclerosis is limited by the inability to objectively measure plaque stability and other predictors of clinical events. Education regarding CAD is extremely important. Publications and articles available from the American Heart Association provide a wealth of information. The most effective and probably the most cost-efficient means of reducing the burden of disease secondary to atherosclerosis in the general population is primary prevention. The role of diet and exercise in the prevention of atherosclerotic cardiovascular disease has been well established. Education of the general population regarding healthy dietary habits and regular exercise will reduce the prevalence of multiple coronary heart disease risk factors. (See Treatment Strategies and Management) For patients with risk factors refractory to lifestyle interventions, education can enhance compliance with prescribed therapy. For patient education resources, see the Heart Health Center and Cholesterol Center, as well as High Cholesterol, Lifestyle Cholesterol Management, Chest Pain, Coronary Heart Disease, Heart Attack, Angina Pectoris, andStatins for Cholesterol.